UK Power Networks - Danger! YOU ARE HERE home over 11 Danger! 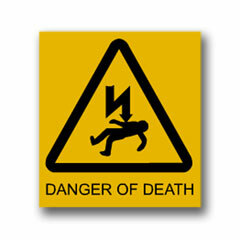 Electricity is extremely dangerous. Fact. You could be seriously hurt or killed if you mess about with electrical appliances, electric sockets or electricity flexesElectric wire covered in an insulating material like plastic. in your home. You could also be seriously hurt or killed if you play in substationsSubstations are an important part of the national grid. They contain transformers which increase or decrease the voltage of an electric current. Substations are very dangerous if you try to tamper with them or vandalise them. Do not enter a substation for any reason - it is against the law and you could be electrocuted., near overhead linesThick electric cables that carry electricity from where it is generated to where it is used. on wooden poles or around electricity pylonsA tall metal tower that carries very high voltage. This means that if you get too close to power lines or a substation, the electricity could pass through the water content of your body as it tries to find the easiest way to get to the ground. You could get an electric shock and might even die. Electricity in the home can also be dangerous if you don't respect it. Try Spot the Hazard. 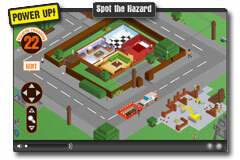 Can you find all of the hazards?